Tom Hanks in the movie ‘Forrest Gump’. Numerous sciences evaluate hypotheses directly against reality. These include biology and associated natural sciences, including chemistry, genetics and medical research. Applied medicine is slightly removed from reality because it tends to be influenced by social mores, religion, politics, geography, and economics. I have been charitable to my fellow geologists by placing geology halfway between Reality and Fantasy. Appropriately, a fault runs through it. A student of geology will have a number of textbooks covering the various topics, and one, for example, will be on crystallography. A crystal can be held in the hand, have its angles measured using a goniometer, be subjected to wet chemical analysis, spectroscopy, x-ray fluorescence and diffractometry, emission spectroscopy, neutron activation, the list continues. Direct feedback places crystallography on the left hand (Reality) side of the Chocolate Box. Geomorphology, on the other hand, dealing with the formation of landforms, falls on the right-hand (Fantasy) side of the Chocolate Box. Major river valleys have been allegedly formed by wind and rain and burrowing worms, etc. over almost limitless time, as required by uniformism. Catastrophism explains how they are the result of repeated major floods following asteroid impacts sufficiently severe to move Earth’s geographic poles as the continents plunge beneath the oceans. Continuing toward Fantasy we encounter the fields of astronomy, and then cosmology. I am not at all dismissive of astronomy, in which dedicated scientists have introduced us to many wonders of the Universe. Everything is so far away, however, that most of their explanations are based on conjecture, rather than proof. This has led to a desire on the part of astronomers to find something in their science, anything almost, that would become as universally accepted as DNA or the germ theory of disease. A claim that most astronomers agreed upon is the energy source of the Sun, and every introductory book on astronomy confirms this. Cosmology is a different situation. Its practitioners have been inspired by celebrities such as Stephen Hawking and Roger Penrose. I read Hawking’s book ‘A Brief History of Time’ and the errors in reasoning practically leaped off the page at me. I examined some of these in chapter #16, on ‘Cosmology I’. I don’t doubt Stephen had high intelligence, but he would not have got away with so many momentous blunders if not for the tragic medical affliction that trapped him in a wheelchair. He may have told people “Treat me like you would anyone else.” but no one ever did. Stephen Hawking was a talented writer in a genre that is almost unique, and that is popular science-fiction that is represented as fact. The claim that the general theory of relativity requires the Universe to be expanding has received wide acceptance. This is not a test of the general theory of relativity, however, but an example of its misinterpretation. The role of gravity has always been exaggerated while the role of electromagnetism has been neglected. Gravity may be easier to study, but that is not sufficient reason for ignoring the strongest force in the Universe. A recent trend in cosmology has been speculation about ‘multiple universes’, which is a direct outcome of the complex mathematics used in the investigation of ‘superstring theory’. I will compare this to much simpler calculations I have carried out as an exploration geologist, using seismic refraction equipment to search for buried channels that could host alluvial gold deposits. When the formulae used were entered into a pocket computer, two answers were produced. One was negative, which was to be discarded, while the positive one was accepted. Even a geologist can get that right. Subsequent trenching with a backhoe confirmed the depth as long as the right velocity, based on experience, was entered for the type of overburden present. The mathematics involved isn’t difficult and reminds me of when slide rules were employed, back in the days before calculators. One of the limitations of a slide rule is that it will not carry a decimal point. A parallel, approximate calculation has to accompany the actual one to keep track of where to place the decimal point. While that can seem like a pain there is a benefit as well, in that a degree of personal contact is maintained with the process, so that one retains a sense of the magnitude of values that are being employed. Superstring theory is totally different in that enormous amounts of data are fed into a super-computer, and the operator is left with little sense of what is taking place in there. Whatever comes out is accepted, and if that means fifteen different universes without the slightest justification, then so be it. Some popular journals, like Scientific American, have promoted this nonsense for decades. “Even the most unlikely events must take place somewhere.” Such a warped concept of ‘infinity’ is accepted as proof that somewhere out there is a world the same as ours, with people the same as us, and one of them has my name and is writing about me just as I am writing about him. Such nonsense deserves no place within the realm of science. This would be recognized by most thinking people but not, evidently, by some practitioners of cosmology. The Big Bang traces its origin directly to the Vatican, so there must have been another Mary and Jesus as well. I suggest the Vatican get on to this right away. Is there more than one God? Superstring theory guarantees it. Relativity is imagined by some to represent a rebuttal to any plea for more common sense in science, by which I mean things that are more readily understandable to them. The speed of light, however, has been determined conclusively and as soon as it was found to be constant, relativity became inevitable. Without Einstein, it would have been explained, eventually, by someone else. Of course, that is not the same as saying that it would have been accepted as readily. Science used to exist without boundaries. Students would study what we now separate out as geology and astronomy, and physics, and chemistry, and biology and other topics. But as knowledge increased, scientists narrowed their areas of interest and began to learn more and more about less and less. They became specialists. Specialization is regarded, by those who profit from it, as sensible and necessary, and prestige and reward are tied directly to it. Its advantage lies in the increase in the quantity of scientific work that can be carried out. This increased work has led to greater numbers of scientists, and greatly increased budgets, as the frontiers of knowledge have been extended. In this manner, the grand enterprise called ‘Science’ has flourished. There is also a disadvantage. As specialists concentrate their activities within an increasingly narrow field, they are required to defer to others outside of it. Specialists commonly employ the findings of specialists in other fields without question, although ignorant of problems that may be present in those fields, and the result has led much of science away from reality. Generalization, or the application of knowledge across boundaries separating various branches of science, points us toward a remedy. It must be emphasized, however, that generalization must not mean cooperation between specialists. The belief has become established with the general public that with the progress of science there is no longer the opportunity, much less the need, for scientific revolutions. Actually, the requirement has increased, so that it is greater now than at any time in the past. Scientists defending their science are required to constantly defer to others within their own specialties. In this way, scientists end up defending not only what they know but what they don’t know as well. Players of the board game Monopoly own portfolios of hotels and railroads. Reality returns when the game ends, as most of us don’t own portfolios of hotels and railroads in real life. In a similar way, some scientists dream about protecting Earth from asteroids and populating Mars and communicating with aliens. For them, however, the game doesn’t end. These people are not fully in contact with reality, but the cost of their wages and travel and expensive equipment are paid for by the productive part of society. Their failure is not due to any lack of intelligence, interest, commitment or opportunity, but the result of an organizational aspect of their training, and its application. 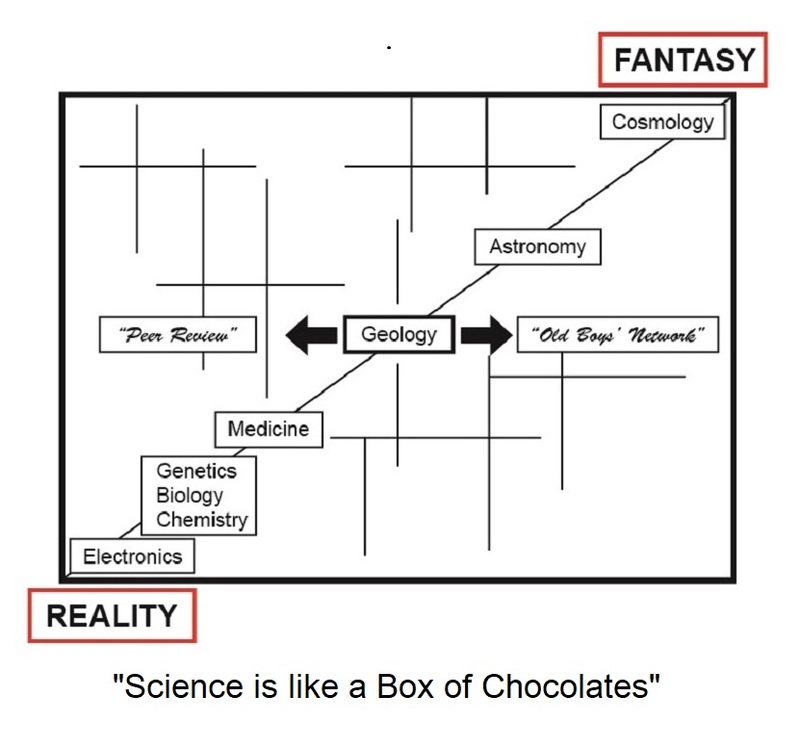 Carl Sagan’s claim “Science is a self-correcting enterprise.” applies to only the left-hand side of the Chocolate Box, which is ironic since his field, astronomy, is on the right-hand side. The fault line runs through geology, and specialization makes the difference. On the left-hand (Reality) side in the graph, specialization is not only tolerated but is widely beneficial as well. On the right-hand (Fantasy) side, where everything is a long way away, specialization consists of conjecture piled onto more conjecture by self-proclaimed authorities. As specialists pursue their own interests, the resulting fantasy is no more subject to confirmation by logical investigation or analysis than the doctrine of any religion. In his book ‘Worlds in Collision’, Velikovsky examined the worldwide concept of history divided into ages. In the traditions of civilizations from Greece to Israel, and India to China and Polynesia, and to the hemisphere of the Incas and Mayas, history has been divided into ages. It may also be significant that in some of these traditions the word for Sun was used instead of one for epoch. Velikovsky reasoned that this might be attributed to the changed path of the Sun across the sky. 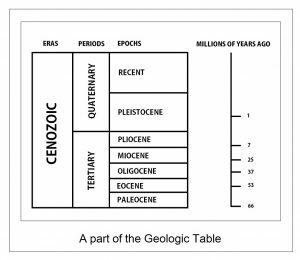 Geologists have divided geologic time in a similar manner so that epochs of the Geologic Time Table might as aptly be called Suns due to the changed path of the Sun across the sky for each one. The number of axis changes has been many times more than the number of recognized epochs, but this at least explains the concept. Major extinctions of species often occurred at the end of periods, which constitute the next larger divisions of geologic time. At the end of each period, most individuals of advanced life-forms on Earth, at least on land, died. Repeatedly, multiple species would never again contribute to the fossil record. If we consider the number of past catastrophes, their evolutionary significance, the abundance of evidence they left, and the inevitability of their continued recurrence*, the widespread cult of uniformism seems perplexing. Why have we denied our history? This question can take us far indeed — through a study of psychology, and history, and religion and politics. My intention was to explain the cause of catastrophes, and to demonstrate how all natural science has been corrupted by a denial of their occurrence. I did not intend, at first, to offer reasons for the dogma of the scientists, and yet it seemed wrong to avoid the question altogether, so I shall have something to say about it. It is an accepted principle of psychology that some personality characteristics develop as a defense against anxiety. Children often perceive their surroundings as threatening, and we have all had to deal with insecurity in the past. Various coping skills are developed to deal with insecurity, and characteristics of adult personality develop as a result. These characteristics can be beneficial, leading to increased productivity, but the price paid may be a reduction in the free functioning of the mind. Reality becomes increasingly difficult to recognize when affected by increased anxiety. In ‘Worlds in Collision’, page 298, Velikovsky pointed out that the memory of our most terrifying experiences are sometimes blotted out from consciousness, and he likened this phenomenon to a process by which entire nations came to regard their traditions as allegories, even though actual events were described. Many accounts of cosmic disturbances have come down to us which the ancients explained in terms of miracles. Because most modern scientists do not believe in miracles they have discredited the accounts along with the explanations. Major religions of the world commemorate these events, and valuable historical descriptions are contained in numerous religious texts. The incredible level of anxiety endured by our ancestors, when every city on Earth was left in ruins, led them to replace earlier beliefs with new ones that addressed the insecurity of their time, and which we have inherited. The determined separation of science from anything religious prevents scientific consideration of any religious description of past events. If you really want to know how fossils formed you should visit a Creationist museum; these people know there was a flood. A plausible reason for the rapid and widespread acceptance of uniformity was offered by Velikovsky. In Europe, the Battle of Waterloo in 1815 ended a period of tumult that had begun with the French Revolution, a quarter of a century earlier. There was an overwhelming desire for peace and tranquility, and the concept of uniformism fitted the yearnings of the time. In this way, a political climate may have helped to establish a scientific doctrine that would prevail as none other, and which would not find the obscurity it deserved until another two centuries had passed. Sir Charles Lyell is remembered for his book ‘The Principles of Geology’, first published in 1830. This book promoted a concept he called ‘uniformitarianism’, now thankfully shortened to ‘uniformism’. The basic thesis was “That no causes whatever have changed the earth except those that still do so under the eyes of man.” So effective was Lyell in denying catastrophic change that his concept of uniformism became accepted by scientists everywhere. In time, this viewpoint would come to corrupt most of the natural sciences. Lyell’s criticism of catastrophism was inflexible and absolute, and he accused the ancients of being unconscious of their ignorance. With tremendous irony, he belittled catastrophism as dogma “…calculated to foster indolence and to blunt the edge of curiosity…” His influence was far-reaching, and his work was used by others as a foundation upon which to build. Charles Darwin developed his theory of evolution in part upon a principle that not only lacks proof but flies in the face of evidence that was sufficiently known, even in the time of Lyell. In a West Yorkshire cave, 440 meters above sea level, and buried beneath 4 meters of clay and boulders, were found numerous remains of hippopotami together with those of mammoth, rhinoceros, bison, and hyena. By way of explanation, Sir Charles Lyell, writing in ‘Principles of Geology’ speculated on a time when African hippopotami swam north to spend their summers in England, making a timely retreat to the south before the snow and ice set in! A comparison between uniformism and Darwinism provides rather less difference than one might expect. Darwin saw ‘natural selection’ as a gradual process in which small random changes passed through environmental filters. He developed that concept, however, at a time when DNA could only be imagined and there was no science of genetics. Add to this the major influence of oceanic flood upon evolution, and there might not be a lot left for Darwin’s natural selection to describe. Of course, asteroids are natural, but to follow this line of reasoning would require us to redefine natural selection simply to retain the term. My respect for Charles Darwin is substantial because this man who had trained to become a minister of religion, living in the time he did, came to recognize that evolution is the result of natural processes. He saw all life as related and descended from a common ancestor, but he cannot be blamed for not coming up with a definition of evolution that would satisfy us now, as no present geneticist has accomplished that. Darwin might have come closer to that objective, however, if he had been less influenced by the uniformist views of Charles Lyell. Still, Darwin was a superb analyst who made numerous contributions to science, such as his observations on the formation of atolls in the Pacific, which were made during his famous around the world voyage on the ten-gun brigantine-sloop, ‘HMS Beagle’. Few large land animals escape the greatest catastrophes, when continents plunge beneath the oceans; oceans which may then turn acidic from volcanism so that the food chain collapses. Catastrophes vary greatly in the extent of their destruction, from along the meridian of maximum latitude change to where the ends of the temporary turning axis connect with the surface of the Earth. Those two points do not change their latitude or longitude at all, and if one should fall on an upland area far from the sea, it could provide sanctuary for the inhabitants. This brings us to an important factor that escaped Darwin as he struggled to explain the causes of evolution, and that was luck! It is upon the foundation of chance destruction, chance survival, chance association and chance opportunity that the science of evolution must be based. This also brings us to the major driving force of evolution: oceanic floods resulting from axis changes which are the result of massive asteroid impacts. In every major flood, most individuals of dominant life forms from the lowlands die. This provides an opportunity for less dominant and often smaller forms from the hinterlands to take over niches which have become available. Others, not always as eloquent, shared Shelton’s conviction, and scientists vied with each other in making uniformism the deity of their profession. No science could be based upon a hypothesis, so uniformism was elevated to a principle, which reflected beneficially upon its practitioners. 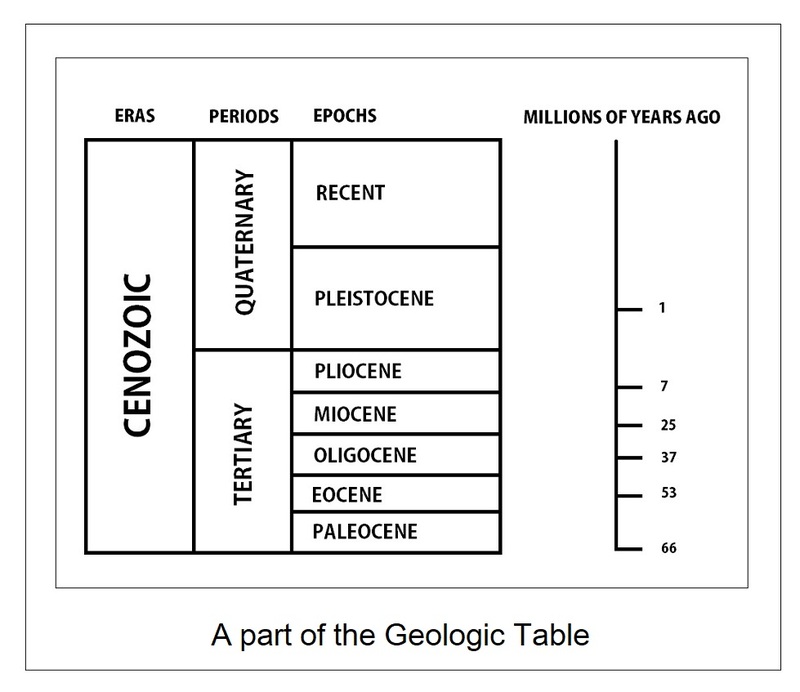 Geologists claim that their understanding of their science is based upon “…centuries of patient observations and careful insights.” As one modern textbook states: “Step by slow step we are beginning to understand how the earth works.” (‘Physical Geology’ by Skinner and Porter). Even to question uniformism had become heresy. A true explanation of the universal acceptance of uniformism may transcend yearnings for security by Europeans following the Battle of Waterloo, to touch the psyche of humankind. Every religion promises an alternative to the insecurity of life followed by the blackness of death. Any who believe they will go to heaven and have eternal life must feel good about it. Similarly, those who accept assurances that geologic processes happen only gradually will feel good about that as well. None of us wants to get caught up in a geologic catastrophe. The essence of every religion is the substitution of certainty for uncertainty. This happens to be the aim of science also so that in this respect theologians and scientists can be said to be engaged in a comparable endeavor. The proponents of religious fundamentalism claim that if we will accept their vision we will enjoy everlasting life, while a scientific claim is that the destiny of humankind is to spread throughout the galaxy and populate other worlds. Note that in both scenarios we’ll be just fine, which carries the unfortunate implication that caring for this world is not much of a priority. That every society in the past has functioned out of contact with reality matters little, except for species sent to their extinction along the way. With our ability to totally destroy ourselves, we must recognize that we are a part of the natural universe and subject to its edicts and limitations. We can limit our numbers and our demands on this planet, or cease to exist, a rather more important concept, I submit, than any individual rights of procreation, pollution, and devastation without constraint. Those who promoted the uniformist view of science in the early 1800’s were probably repelled by considerations of catastrophism, and may even have been influenced by their personal belief in a merciful God. If this interpretation is correct it is ironic indeed, for competition was provided the scientists by Christian fundamentalists who sought evidence for the Noachian flood described in the Book of Genesis. These were the Creationists and they believed in catastrophism. 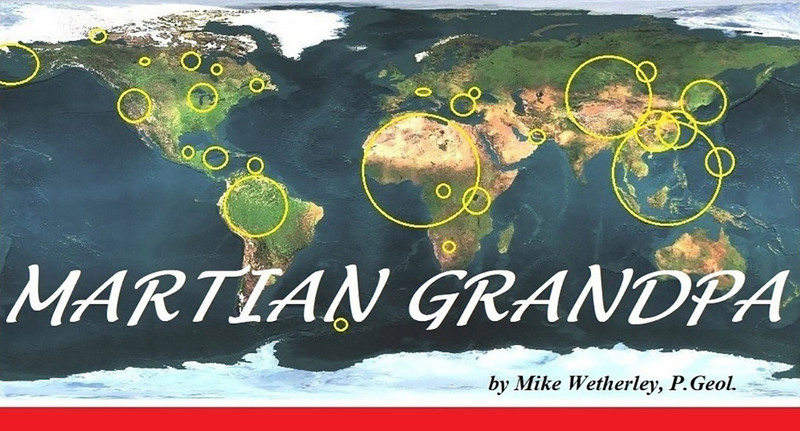 If secular scientists had not vehemently denied and tried to suppress claims of a worldwide flood it is likely that the Creationist movement would not have attained nearly the degree of influence it has reached in America today. History belongs to us by right of birth, and science belongs to us because we pay for it. Scientists have appropriated science for themselves and changed its language to one only they now comprehend. They have devalued the wisdom of the ancients and impoverished our culture by doing so. I read ‘Target: EARTH’ by Allan O. Kelly and Frank Dachille with a sense of regret. It was published while I was in high school, but I did not become aware of it until decades later. It helped to develop my concern about what constitutes the scientific wisdom of our times. In short, much of it offends me. Transgressive seas and axis changes and oceanic floods and ray craters and splosh craters and island arcs and magnetic reversals and fish strata and the Big Bang and missing neutrinos and missing dark matter and missing dark energy and longitudinal sand dunes and comets and frozen mammoths and ice ages and interglacial stages and snowball earth and cosmic rays and cosmic strings and super strings and tektites and marine terraces and submarine canyons and salt lakes and hippopotami bones and canals for seals and tsunamis and Valles Marineris and topsoil and varved clays and badlands and the Scablands and planetesimals and the asteroid belt and the energy of the Sun and fossil forests and Olympus Mons and black holes and wormholes and interglacial stages and Folsom points and yardangs and Australian glaciation and the Belcher islands are not concepts that can be corrected with a little scientific fine tuning. Instead, they are interconnected components of an extensive system that is perpetuated by a pampered class in society, not all members of which are fully in touch with reality. “To be a scientist is not only to do what scientists do, but to accept what scientists accept – especially the paradigms that one’s predecessors and colleagues have built”: A Professor of Sociology at an American University. This goes a long way toward explaining how fantasies constituting the science of cosmology, in particular, have become so widely accepted by scientists, who promote them in turn to the general public. To be a scientist one has to “…accept what scientists accept…”? This is unadulterated nonsense. 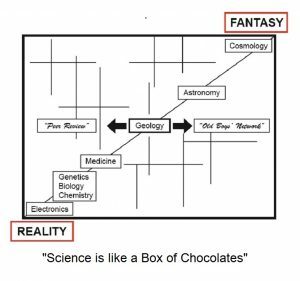 So much science on the right-hand side of the Chocolate Box is wrong, so what logical argument can be made for accepting it? To be fair to the professor, he was probably describing a circumstance rather than implying an imperative. One advantage being gained by deceiving the public is a perceived social benefit for those seeking to bask in approval provided by the ‘Old Boys’ Network’. It all comes back to the Chocolate Box. On the Reality side science progresses as well as any human endeavor can be expected to function. They have their own specialists, as well as ‘peer review’, although to quote Dr. David Moher of the Ottawa Hospital Research Institute: “We do not have any strong evidence anywhere that peer review works.” At least peer review is tolerated on the Reality side, while on the Fantasy side it has morphed into the pastime of protectionism. When well-known astronomer Fred Hoyle collaborated on the ‘Steady State Theory’, he marveled at how it was attacked “with an almost insensate fury”. It is clear that the further ideas are removed from the opportunity for hypotheses to be evaluated directly against reality the more outraged are the cries of dissent by those defending their faith. Researchers in genetics or biology who are pretty sure of their facts will generally listen respectfully to alternative suggestions. The foundation stones of Cosmology are the ‘redshift of galaxies’ and ‘microwave background radiation’. Both of these were misinterpreted and subsequent conjectures were piled on top. Geology has the opposing principles of ‘uniformism’ and ‘catastrophism’, and you know which one of those is correct.